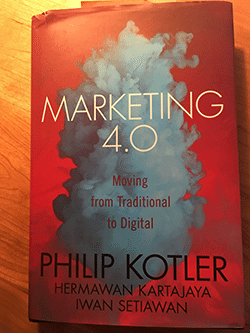 Marketing 4.0 is a new book by a giant in marketing, Dr. Philip Kotler. As one of the authors of the seminal marketing textbook, “Marketing Management,” Kotler and his two co-authors produced a work that is informational, easy to read, fresh and timely. If you only read one marketing bookin 2017, make it this one! Power is shifting to the connected customer and decisions are influenced more by the “f-factor,” friends, family, fans, and followers. Social selling is here and so is data. Kotler, et al. write about the landscape as becoming more horizontal, inclusive and social. These are interesting trends that will surely impact marketing strategies and tactics. I enjoyed this book’s take on connectivity impacting competition and customers found on page 20. Collaboration, communication, and co-creation are now the hallmarks of the enterprise positioned to win in the digital marketplace. Younger people are referred to as digital natives, and they influence their friends and family to become more connected by inspirational example. The authors of this book do not suggest digital marketing will replace “legacy” marketing. Instead, they suggest the need to coexist to deliver the best customer experience. They envision as seamless, analytics-powered approach to the market taking into account communications, recommendations and connections. Both online and offline. On page 26, they raise the notion of an increasingly distracted customer. The book cites a 1/3 decrease in the attention span of the average human from 200 to 2013. As a result, marketers need to make certain to build advocates to accelerate their efforts. It is important to earn positive advocacy to offset the negative comments that will no doubt surface with scale. Women are the growing market share, and the segmentation of this market is important. Marketing 4.0 segments the female market like this: stay-at-home housewife, plan-to-work housewife, working woman with a job, or career woman. Family and work are most important. Women are information collectors, and for the marketer, this means they should be the focus of marketing communications and education efforts. There are 3.4 billion internet users-45% of the world’s population, according to United Nations estimates. Netizens are social connectors, expressive evangelists, and content contributors. Together, youth, women, and netizens hold the key to marketing in the digital economy. The four P’s are shifting. Product used to be developed by needs and wants gleaned from market research. In the digital economy, co-creation is more likely the product development strategy. Pricing is no longer static; it’s dynamic. And today promotion is now a two-sided arrangement using social media and customers as audiences. Finally, with active participation, selling is changing to what the authors call transparent commercialization. I like that term…. Digital marketing is not meant to replace traditional marketing. They must coexist, and the digital marketing must drive advocacy. The accountability of digital marketing also gives it tremendous potential to drive results and show attribution. The new customer path – My favorite takeaway from this book! Aware – customers are passively exposed to a long list of brand from experience, marketing communications and/or the advocacy of others. Appeal – Once people become aware of a brand they are exposed to, short term memory amplifies long term memory to create a situation that appeals to customers. Big brands do this well. Ask – Once they reach the appeal stage, customers follow-up by seeking more information and asking questions from friends, family, the media or anywhere else they see fit. This stage is complicated by the combination of both digital and traditional methods so that attribution can be a challenge. Act – Once all of the asks are gathered, customers may be ready to act. It’s important that there are other ways for customers to act other than buying. Something that indicates interest or intent. There two graphics on page 62 and 64 to illustrate the old path compared with the new one and the new path fleshed out. When a company studies this new path for their business, within it, they may find an authentic differentiation or a hidden experience problem. Outer influence comes from external influences and is still manageable and controllable. These are from marketing communications and areas like the sales force and customer service staff. Others’ influence is also external because it comes from a close circle of friends and family as word-of-mouth. Remember youth, women, and Netizens! Own influence comes from within oneself. It is based on one’s history with a brand or service and can be swayed by outer and other. This new path of Aware, Appeal, Ask, Act, and Advocate requires new metrics. PAR measures how well brands convert awareness into a purchase. BAR measures how well brands convert awareness into advocates. Both of these are important because one converts into sales and the other into advocates, both are worthy goals! Figures 6.2 and 6.3 on pages 76 and 77 of the book explain these metrics. Conversion rates at different points on the path indicate opportunities. For instance, a low conversion rate from aware to appeal for a brand reflects low customer attraction. And a low conversion rate from appeal to ask indicates low curiosity. People don’t feel the need to go any further, and fixing this is good. On the other hand, too many questions mean the brand message is unclear and may require significant resources to answer all of these questions. Paying attention to these ratios and looking for possible intervention points is important. Figure 6.5 on page 79 is helpful for understanding. Google coined the term “Zero Moment of Truth”(ZMOT) to describe a pre-purchase phase where customers curiously search for information. A marketers job is to figure out how to get their brand in front of this client at this moment. I call this “COGNIFIED” and talk about it a lot on the Cognified Marketing and Selling Podcast. Attracting and convincing customers are important steps toward creating loyal brand advocates. A purchase is the first step in creating an affinity and building advocates. The post-purchase experience is improved by increasing touch points and allowing more interactions. A survey by JD Power revealed that 67 percent of U.S. Customers had used a company’s social media for servicing purposes. I do it all of the time! Kohler plumbing is the best I’ve experienced. “The problem, however, is that marketers often see content marketing as another form of advertising and social media as other forms of broadcast media. Some marketers simply shift their advertisements to social media without significantly reinventing the content. They see the content as the longer versions of an advertisement. Figure 9.1 on page 125 provides a detailed step-by-step content marketing guide. It’s excellent! To sum up this book in one phrase is simple: Must read. If you’re a marketer, aspiring marketer or just a curious sort, Dr. Kotler does not disappoint with his most recent work. I highly advocate for this book! Get Marketing 4.0 from Amazon. Hi, in this Book you have a lot of new and interesting information for Marketeers to adapt to a new era. This resume is very useful.